Expectations are always high after a fallow year…but 2013 surpassed all expectations. A record was set for the fastest ticket sell out at the beginning (in October 2012), while at the end the BBC announced all-time record viewing figures – both at home and internationally – since they began broadcasting live from the site in 1997. The outside broadcast operation was even nominated for a prestigious BAFTA award! It had to be a big year after a year off…and it was. The final confirmation on the Rolling Stones first ever appearance at Glastonbury Festival came through on March 27, a phone call witnessed by John Humphrys of the Today programme following a tour of the farm with Michael Eavis. Humphrys later became the only UK journalist to be granted an interview with Sir Mick Jagger, two days before the Festival, in which the singer revealed he had once dreamed of becoming…a journalist. It was also the year of the Arctic Monkeys, playing an exclusive UK set on the Friday night featuring their multi-award winning new album; and also Mumford & Sons. 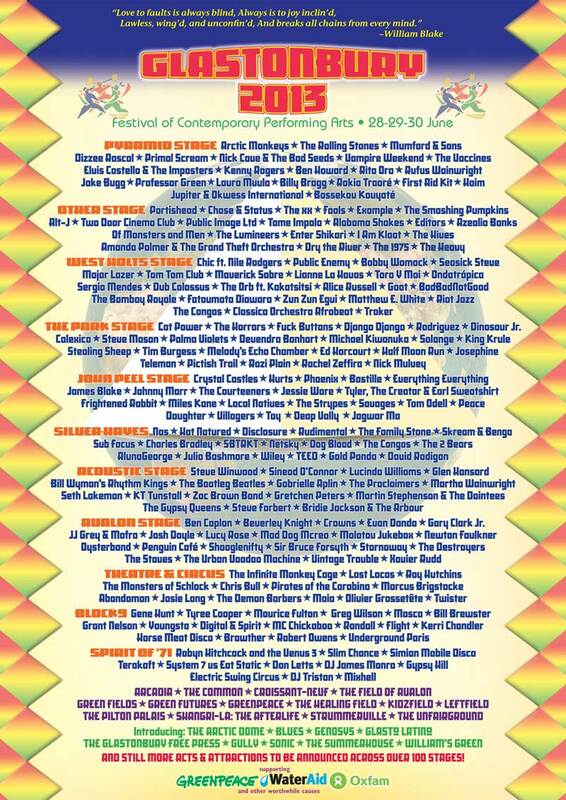 Marcus and co began their Glastonbury career playing to an audience of 50 at the Greenpeace Airport Lounge in 2009. By the end of 2013 their set closer, a rendition of the Beatles’ ‘A Little Help From My Friends’, became the only music video to make the YouTube year end Top Ten. 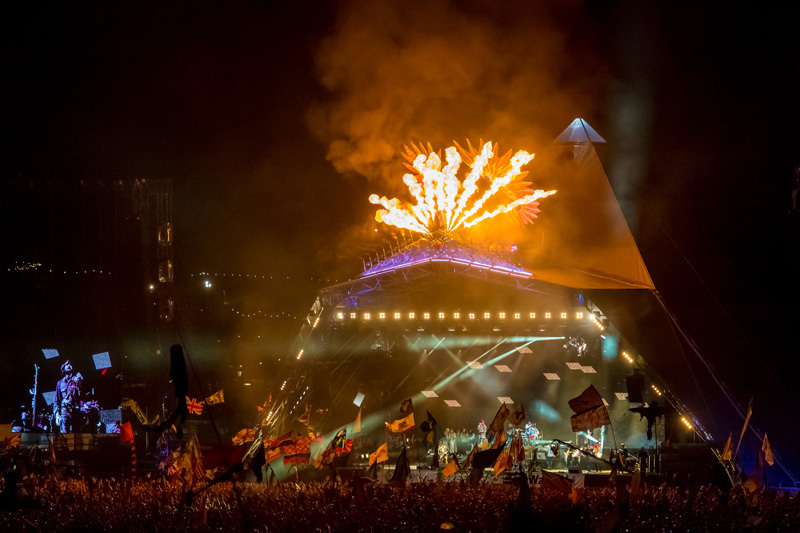 Linking both The Rolling Stones’ and Mumford & Sons’ performances was the mighty flame spewing Phoenix; a fantastic contraption designed by artist Joe Rush from the Mutoid Waste Company (a long term Glastonbury collaborator); sitting atop the Pyramid during the day and bursting into life to add to the night time spectacle on one of the world’s most famous stages. As is so often the case with a ‘comeback’ year, 2013 was also a year of dramatic improvements and additions all over Worthy Farm. Hugely improved drainage and water provision, a dramatic increase in the number of ‘long drop’ toilets, improved roads and trackway. On the ‘green’ side there was a hugely welcome decrease in the number of people travelling by car; for a the first time, 35 per cent of festival goers opted to come by bus or coach. Meanwhile up the hill and away from the stages, Glastonbury Festival’s crack recycling team managed to recycle over 39 per cent of the Festival’s waste. In the camp sites too, there were noticeable improvements, not least with the arrival of a whole new camping field – Worthy View – outside the fence above King’s Meadow. Out and about in the all night city, 2013 will also be remembered for a host of other highlights. The first appearance of Rastamouse in the legendary Kidz Field; and possibly 20 (at the last count) incredible impromptu sets from US producer Skrillex (so good he was booked to headline on the Other Stage in 2014!). The launch of both the Gully and the Sonic stages at Silver Hayes, part of a brand new incarnation for the dance area. The inspired resitting of Arcadia – to a corner of the Other Stage field – which allowed Chase & Status to headline the Other, then DJ in the Spider straight afterwards. The birth of the Hell Stage in Shangri-La just a taster of all the late night madness in SE Corner, which also included a waterfall, The Temple, christened by DJs/producers Dusky, and all the revels of the Unfairground and the Common. 2013 began with the Green Fields celebrating the summer solstice with a truly astounding bonfire and firework display on opening night – while for many Sunday night ended on Monday morning outside the towering Gen-0-Sys installation in Block 9, one of the most powerful amalgams of art and light and sound that the Festival has ever witnessed.